Fleshing out your shop’s e-skeleton. There are at least 7… no, make that 20… places on the Internet where you can list your business for free. 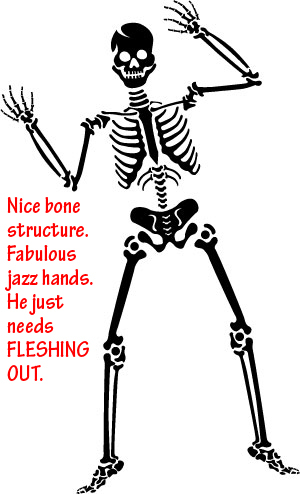 but in “skeleton” form. Flesh out the facts on these listings sites, and spread the word about your business to new and potentially profitable consumers. Add crucial information, photos, even a personal welcome from the owner. And once you’ve enhanced your listings, Auntie Kate strongly suggests asking your loyal clients to post reviews. Cute skeleton from The Grammar Belle.